Saint Bartholomew was one of the Twelve Apostles, and had Galilee as his homeland; this is all that is known of him for certain according to the history of the Gospels. Concerning his apostolic work, certain say that he preached in Arabia and Persia, and especially in India, bringing to them the Gospel written by Saint Matthew, which had been written originally in Hebrew, and which was found there one hundred years later by Pantaenus, formerly a stoic philosopher and later an illustrious teacher of the Christian school in Alexandria (see Eusebius, Eccl. Hist., 5: 10). Other accounts say that he went to Armenia. According to some, he ended his life by being crucified, or by being flayed alive, in Albanopolis (Urbanopolis) of Armenia. This also confirms an ancient tradition preserved by the Armenians. According to some, Bartholomew and Nathanael are the same person, because the Evangelists who mention Bartholomew do not mention Nathanael; and John, who alone mentions Nathanael as one of the Twelve, says nothing of Bartholomew. Indeed, Bartholomew is a patronymic, "son of Talmai," which means "bold, spirited" (see also Jesus of Navi 15:14; II Kings 3:3), and Nathanael could have had this as a surname. 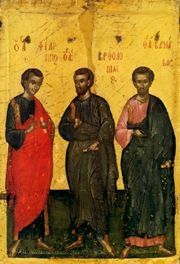 According to the Synaxarion of the Menaion on April 22, however, it is Simon the Zealot and Nathanael who are the same; the Evangelists who mention Simon the Zealot (or "the Canaanite") do not mention Nathanael. To the Church thou hast appeared as a great daystar; with thy teachings as thy rays and beams of awesome miracles, thou hast enlightened those praising thee, the Lord's Apostle, O sacred Bartholomew. Share the feast of Bartholomew the Holy Apostle with an icon greeting ecard.